New year … new bench! Yes, I like the start of a new year, there’s a whole virgin year, unspoilt to go at, rather like early morning with all the day ahead. I’ve been promising myself a new bench in the woods. The old one is rather a mess: cobbled together tail vice that’s splitting apart, partly burnt from an early forging accident, another big split the wrong side of where the holdfasts anchor, and worst of all the flippin top is far from level. 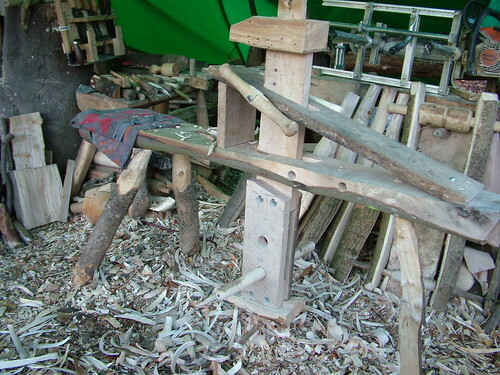 I’ve been holding back from this job, partly because of the busy Christmas season, and partly because I need to mill a large piece of beech for the new bench top and the last time I used the mill there was a major problem – it stopped cutting (how can a chain saw going full rip not cut ?). So prior to giving in and lashing out on the expense of a new pico narrow bar and matching ripping chain, I thought I’d give it one more chance. Firstly I sharpened the ripping chain, only this time I checked the depth gauges. I don’t know how this has happened, I always check them on the regular chain, but the ripping chain needed several strokes to lower the gauges. So that would be why it stopped cutting, I’d finally sharpened the chain into the ground and not kept up with the depth gauges so they were preventing the cutters taking any shavings at all! The milling went well, reducing a beech bole to a manageable 11 inches square piece ready for milling bench tops. 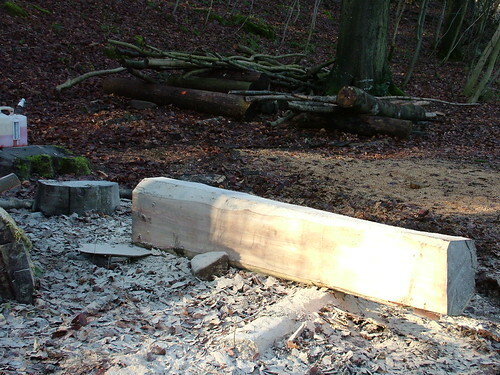 Rather short of photos as I was a bit busy, but now I have two large planks ready for making up. Resharpened the saw, changed back to the normal bar and chain and cut one to length – 4′ 2″ like the old one. But a consistent 3 1/2 inches thick, rather than half-round. Now I need a working, but unfussy plan for the tail vice. I’ve been browsing The Workbench Book for inspiration and I now have half a plan. On the subject of books, and The Workbench Book in particular, like the Internet, don’t just take everything for granted. I used the rough drawing of Drew Langsner’s dumbhead horse for my recent modification, only to find the measurement of the arm in the book gave 30″, this turns out to be the length of the arm inside the joints, rather than overall. My 30″ arm needed drastic lengthening to compensate. But gave an added bonus of being able to fit a cross footrest that I’m happier with than the little plate that is more standard on dumbheads. I took the opportunity to provide a child-height cross treadle hole too.